During a track day at Sandown Raceway in Springvale, Victoria, I had a bit of an encounter with some curbing on turn four. After that, the car never really tracked the same, especially over 80mph. The rear end would shift directions rapidly like you were tailgating a semi at speed. This sensation was amplified with weight in the back. 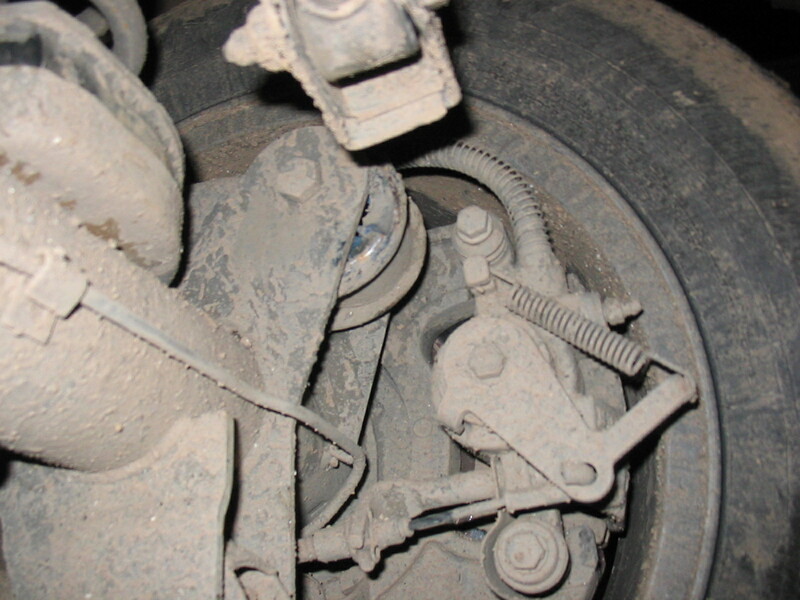 Midway through a cross country journey with my friend Steve, it needed to be fixed. Thanks to some junkyard and parts house scrounging and the tools, farm, slab of Carlton Draught, and assistance of my buddy Luke, we managed to get the thing fixed and back on the wide open roads. And check out that BMC Diesel tractor! First of all, the rear of the car needed to be raised from its previously grounded position. 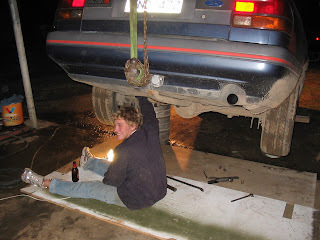 Not having a lift isn't a problem if you've got a chain fall, some beer kegs, and a bit of rope. After tying on to the trailer hitch and hoisting it up, it was obvious that the donut shaped passenger side upper control arm bushing was almost completely hollow in the center and the transmission mount sheared off. A quick run to town during the day yielded the transmission mount but since I didn't have a press, the control arm bushing presented more of a problem. After stopping by several self service yards, parts were finally uncovered. After several beers, the parts were installed. The next morning they were tested on the way to Winton and North to Sydney. 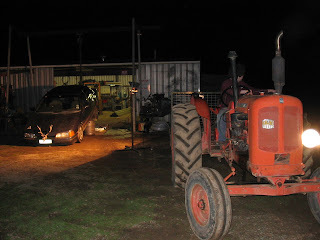 Almost as much fun as the repair itself (really) was cleaning out Luke's dad's garage and boat repair shop which contained a wooden boat with a Lexus V8, turbocharged Holden Red Motors, and vintage Australian motoring relics abound.